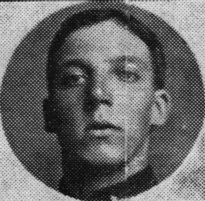 The death of L/Cpl William James Rothin was officially reported in December 1917 – he was a regular soldier in the army at the outbreak of war. He was amongst the first BEF and was present at the Retreat from Mons, and was subsequently wounded by shrapnel. He subsequently landed at Gallipoli and was wounded in the head and hands, and was finally sent to Salonika where he fell one month before his 24th Birthday. Before enlisting he was employed by the GWR at Cardiff. Tragedy was to strike the family again. William Rothin’s father, who also worked for GWR from the bridge over Woodshears Road at about 6.30pm on Armistice Day. His wife was at Christchurch for an Armistice Day service commemorating amongst others, their son. Mrs Rothin became seriously ill as a result. The coroner passed the verdict death by misadventure. The funeral took place at Malvern Cemetery; mourners included his son Bert and brother, George.